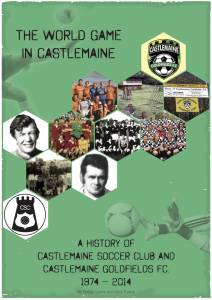 Incorporated 1985 as Castlemaine Soccer Club Inc. Renamed 2007 as Castlemaine Goldfields Football Club Inc.
**Juniors only from 2014 – includes Bendigo Junior Soccer League 1975-198? a game of football was played between miners and troops at the Commissioner’s Camp on the Castlemaine goldfields.